Hi, my name is Carson and I am 20 years old. I was diagnosed with AS around the age of 13, having inexplicable pains in my knees and ankles. I’m now 20 and the pain from my knees/ankles has moved more towards my back, but my medication helps make me (nearly) pain-free. I am now in college at the University of Arkansas. I play club soccer for my school, and I am (extremely) addicted to running & working out. 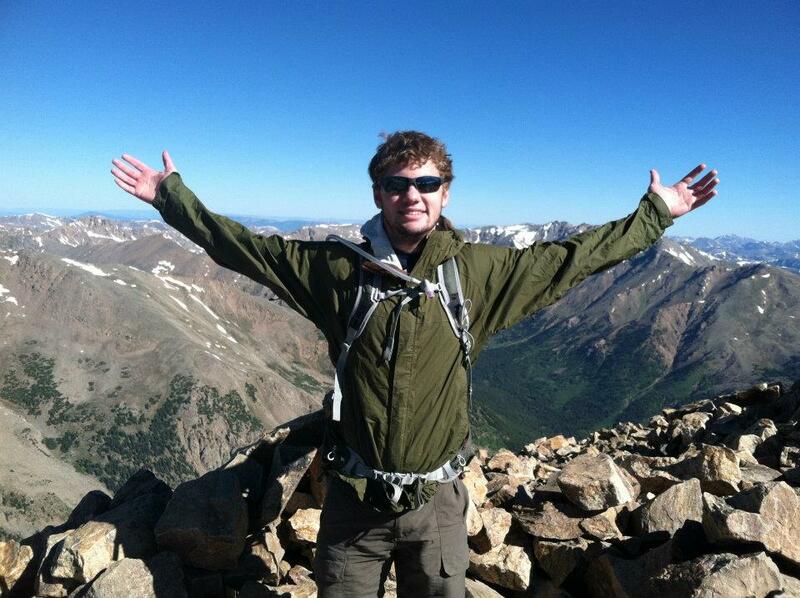 My brother has also recently gotten me into backpacking and hiking (the picture of me is on top of Mount Elbert in Colorado), which has quickly become one of my favorite things to do. My goal is to stay as physically active as possible to try to minimize the effects of living with AS, and so far it’s going great. Hey Carson, I’m glad to hear your almost pain free!!!! I was just wondering what you are taking? I’m taking 750mg Naproxen (Naprelan) a day and 1000 mg Sulfasalazine twice a day. Well Carson I hope things stay that way for you just wish I could do half of what you do . you sound quiet a active young man and I wish you all the best in life . Thank you so much for sharing your story with us. You keep busy, it is the best way to fight Ankylosing Spondylitis. I love that picture, next time I would love if you would take a picture of you saying My name is Carson and I am A.S. Face 0514! Its so reassuring to see someone with this being active! It gives me hope that I will be able to get back in the gym soon! Welcome Carson. I agree with Cookie, staying active is a great way to fight AS. Hope you continue to be that pain free. Glad you are able to stay active in spite of A.S. Good for you! I wish you all the best, and welcome to the group!